Forge of Darkness, the first book ofSteven Erikson's Malazan prequel, The Kharkanas Trilogy, struck me in much the same way that Gardens of the Moon did so many years ago. In both cases, it took me several aborted attempts to get through the book. In fact, it was only the arrival of an ARC of Fall of Light that convinced me to go back and give this one more try. Normally, I wouldn't invest so much time or so many attempts in a book, but my persistence with his first series paid off. While several aspects of Gardens of the Moon kept putting me off, something eventually clicked. There was no 'ah-ha' moment that I can pinpoint, just a span of pages that finally pulled me down into the epic maelstrom and refused to let me go. That series went on to be one of my all-time favorites, so I was eager to read more, and even more eager to explore the history of Anomander Rake and the mythology of his epic sword, Dragnipur. Unfortunately, many of those little things that bothered me about Gardens of the Moon weighed on me even more wit Forge of Darkness. Don't get me wrong, there are some awesome moments in the book, and some fascinating revelations of how the world of the Malazan Empire came to be, but there's far too much filler. This is a book that, for all intents and purposes, comes across an epic fantasy soap opera. It could have made for an interesting evolution of the saga, but it lacks much of the humor of the original books, settling instead for something dry and overly melodramatic. To make matters worse, the very nature of a prequel means we get stuck with whiny, immature versions of some of our favorite characters, forcing us to endure the same coming-of-age aspect that was so refreshingly absent from the original 10 books. I'm not saying this is Erikson's Phantom Menace, but we all know how well that approach worked for Darth Vader. I think there's an element of too much, too soon with this book as well. We were introduced to a lot of characters in The Malazan Book of the Fallen, but that was over the course of 10 books. There, we had a chance to get to know them, to understand them, and to appreciate their contributions to the story. Each of them had an extended spotlight that made them both memorable and relevant. Here, it feels like there are even more characters thrown into the mix, but all at once, over the course of a single book. It's confusing at best, and bewildering at worst. Even with the 4 pages of Dramatis Personae, I found my brain glossing over as to who was who, where they fit, and why the hell I should give a damn. Similarly, while many of the narrative tangents and philosophical discussions in the original series were interesting, adding color to the characters we already knew and loved, here it's too much again. There were pages upon pages where we got mired in nonsensical conversations about grand, esoteric concepts, which did nothing to advance the plot. Instead of accentuating the characters, these discussions defined them - and when you're already struggling to keep tabs, that makes a confusing tale a boring one as well. Add that to a serious pacing issue, with hundreds of pages passing between events of interest, and you have a book that is challenging even to fans. I kept thinking of how Goodkind went off the rails with his repetitive, heavy-handed philosophy, and that's not a comparison I thought I'd ever make with Erikson. Now, like I said, there are some awesome moments. T'riss was, for me, the absolute highlight of the book. Her emergence from the sea of Vitr and journey to Mother Dark is full of action, horror, imagination, and humor. It's like Erikson took everything that made the original series great and put it all into her. Anomander and Silchas Ruin had some great scenes together that evoked memories of Malazan (just not enough of them) while Lord Draconus was a welcome surprise in how strongly he dominated the tale. 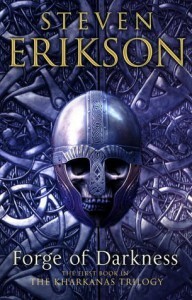 Having said all that, I will still give Fall of Light a read, because I believe Erikson can do better, although I am worried a trilogy may not be enough time to win me back.